first cartoonist to make a fortune in newspaper comics. Not coincidentally, he was also the first to own the feature he created. Fisher (no relation to either Ham Fisher, creator of Joe Palooka, or Dudley Fisher, creator of Right Around Home, by the way) was born on April 3, probably in 1884 but possibly '85. He was working as a sports cartoonist for The San Francisco Chronicle in the mid-19-aughts, when he had an idea for something new  a comics feature in the form of a "strip" stretching the width of the newspaper page. Designed to turn readers into regulars by not showing how the action turned out until the next installment, it would have to appear on a reliable daily basis. Editor John P. Young was dubious at first — in fact, it took Fisher two years to talk him into it. But Fisher finally prevailed, paving the way for the feature now generally regarded as the world's first daily comic strip. A. Mutt (later renamed Mutt & Jeff) began on November 15, 1907. Actually, "had an idea" may not be precisely accurate. Fisher's comic strip was very similar to A. Piker Clerk, which cartoonist Clare Briggs (better known for Mr. & Mrs.) had done in the very same daily format for The Chicago American in 1903. But tho Fisher was born in Chicago, it's unknown whether or not he ever saw the Briggs strip, so let's give him the benefit of the doubt and say he had an idea. Despite the Briggs primacy, A. Mutt is considered the first daily strip because it's the one that sparked a trend in that direction, which continues to this day. Like Mr. Clerk, Mutt was an inveterate horse race gambler. Most of the early gags involved him divining the name of a horse to back from incidents in his surroundings, raising money for a bet, or overcoming outlandish difficulties in reaching the betting window. Since his bet was always placed in the final panel, readers had to wait until the next day to find out whether he won or lost, and then the cycle would begin again. Since Mutt always bet on actual horses that were running in San Francisco that day, he won about as often as anybody else. Mutt had been running only a few weeks when William Randolph Hearst, noting its success in building circulation, hired Fisher for his own San Francisco Examiner. 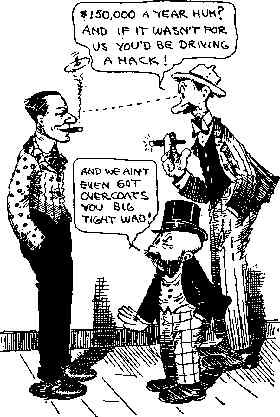 There had already been two legal cases involving transfer of cartoonists and their comics from one paper to another — Hogan's Alley and Buster Brown. In both (as well as a later one involving The Katzenjammer Kids), the original publisher kept the feature, but the cartoonist was allowed to peddle the same characters elsewhere under a different name. But Fisher cagily snuck a copyright notice of his own into the last strip he did for The Chronicle, then registered it with the U.S. Copyright Office. Thus, he was able to force The Chronicle to discontinue its version. When, in 1913, Fisher again moved the strip, Hearst's King Features Syndicate, which by then was distributing it nationally, tried to continue it just as The Chronicle had — but again, Fisher succeeded in enforcing his ownership. His new business partner, The Wheeler Syndicate (which later changed its name to Bell Syndicate), gave Fisher 60% of the gross revenue, adding up to an income virtually unheard-of in those days. At that point, Fisher began turning his strip over to assistants. Within a few years, his only job was to sign his name, which he did on both the strip and the checks — another first for a newspaper cartoonist. As his assistants toiled to produce work under his name (he even claimed sole credit for Mutt & Jeff animated cartoons), Fisher lived the life of a wealthy idler — luxury cars, luxury homes, luxury cruises. He even married a countess, tho the union didn't last. He forgot all the cartoonists, newspaper men, racetrack cronies and suchlike from his earlier years; and with few exceptions, they seem not to have thought very highly of him either. He died in 1954, without accomplishing another thing. According to those who knew him late in his life, fast living eventually palled, and he spent his final years like Howard Hughes, in untidy seclusion. However Bud Fisher responded to success, tho, he'll always be remembered as the man who showed others it was possible to get around the corporations, and achieve wealth from your own creations. Text ©2001-10 Donald D. Markstein. Art © Estate of Bud Fisher.